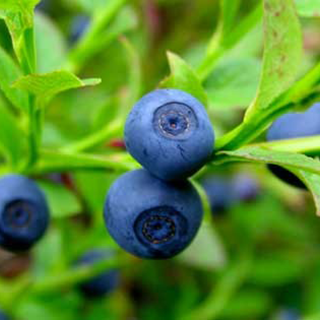 Native to temperate regions of Europe and Asia, bilberry is closely related to the North American blueberry. It has become renowned as a "superfood" thanks to the potent antioxidant proanthocyanidins contained in the fruit. Bilberry jam was eaten by fighter pilots during World War II as it was believed to improve night vision. Use 1 cup of the infusion below as a gargle or mouthwash for mouth ulcers and throat inflammations; 2 tsp (10ml) of the fresh berry juice diluted in 4fl oz (120ml) of water can be used in the same way. Mix 1fl oz (30ml) of unsweetened berry juice with 1fl oz (30ml) of distilled witch hazel and use as a cooling lotion for sunburn and other skin inflammations. Eat a large bowl of fresh berries with sugar and milk or cream for constipation. Drink 1 cup (2 tsp dry berries per cup boiling water) 3 times daily for chronic diarrhea. To support dietary control in late-onset, non-insulin dependent diabetes mellitus, drink 1 cup (1 tsp leaves per cup boiling water) 3 times per day. Prefers moist, very acid soil (pH5.5 or less) in sun or partial shade and water, as it is shallow-rooted. Sow seeds in a cold frame in autumn and transplant to final growing positions when large enough. Or propagate by semi-ripe cuttings in summer. Prune in spring to encourage bushy growth. Grow in a sheltered position. Best grown in large containers in alkaline soil areas. Gather the leaves in spring and the fruits when ripe in late summer.